'Beyond Grace's Rainbow' is an amazing read and I wish I'd read it sooner. It's a story of courage, friendship, forgiveness and love. Grace is an ordinary woman who finds hidden strength to cope with the lightning bolts life throws at her. A single mother, she has a close-knit, eclectic group of friends and family who love and support her through the difficult times. Liam, her son's father a recovering alcoholic reappears in Grace's life when she diagnosed with Leukaemia. He wants to try again and has been alcohol free for over a year but can Grace trust him with her son's happiness and in the circumstances does she have a choice? The quality of the characters ground this story; give it a realistic edge which stops it being overly sentimental. That said it is a poignant read with characters that are easy to empathise with. It will melt even the hardest heart as Grace fights to survive for her son. 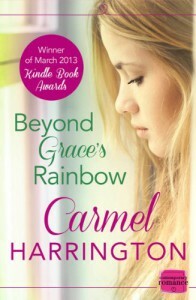 'Beyond Grace's Rainbow' is a well paced read with lots of humorous scenes to temper the drama and a well thought out plot with unexpected twists. It's a feel good, memorable read. Well worth the tears.